Featured Friday Conversations is a series of interviews on Facebook Live featuring incredible women and their health transformation stories. It is our hope these stories will inspire you to take action towards improving your health. What’s the most challenging part of doing a live interview? The unexpected technical issues! I interviewed Jaycie twice on the show because after I reviewed the video, the audio quality was horrible. So we did a take 2! I’m grateful she took time out of her day to do it again. Jaycie was eager to share her compelling story of health transformation, even if it had to be repeated. Jaycie Sullivan is the mind behind The Soaring Swine. She created The Soaring Swine for those who also face or are currently facing the same health and wellness struggles she once did by offering healthy recipes, providing perspective and motivation to those either just starting out or simply trying to move past their current fitness plateau. Jaycie is also an administrative assistant at a local community college. She loves to dabble in kitchen art and quite the craft enthusiast (she loves Pinterest)! She is also an avid gym-rat and had to find and cultivate fitness motivation for herself as well as others. Jaycie’s story focuses on her weight loss journey that began in 2013. Weighing in at 265 lbs, Jaycie was a bit rattled when she saw a photo of herself cooking dinner for her boyfriend . It wasn’t the image she pictured in her head of who she was. This photograph became the turning point that made her want to start making changes in her life. As a college student, Jaycie recalled working at Starbucks where she’d take home the day’s unsold pastries and sandwiches. This is what her meals consisted of, since it was free and accessible. Slowly she started to put on weight. Part of her weight gain also stemmed from spending time with a friend whose cooking was simply irresistible for her to avoid overeating. 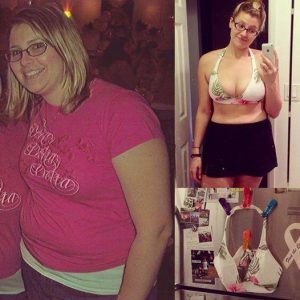 From high school through college she ended up gaining 60 to 65 lbs. “Nothing worth having comes easy”, Jaycie pointed out when we talked about the long and arduous process of weight loss. Initially she joined Weight Watchers where she learned about portion control with assigned points for various types of food. However, the portion control didn’t stop her from choosing ‘unhealthy’ types of food. And in her journey, she had to learn about the importance of selecting more nutrient dense food to fuel her body. One of her sources of inspiration and motivation was seeing her friend at a wedding who lost a significant amount of weight mostly due to healthy food choices. What else drove Jaycie to keep going when the process of losing weight was S-L-O-W? First she needed to stop looking at the scale! I can see how we can get caught up with the number on the scale and when it doesn’t budge, it becomes discouraging. With Jaycie, she was actually gaining muscle and losing inches. She worked with a trainer who taught her how to train with heavier weights to build muscle and lose fat. Slowly but surely the number of inches off her body began to increase. Another source of motivation for Jaycie were Pinterest memes! One that she connected with her the most is “WHAT’S YOUR WHY?” When you read the About page on her blog The Soaring Swine, she wrote about how she no longer wanted to walk up a flight of stairs feeling winded. This was one of Jaycie’s initial Whys. And she also talked about how your WHY changes along your journey. Above is a photo of one of her other ‘Whys’. I like how Jaycie hung a bikini she purchased back when she was 15 years old on her refrigerator which served as a reminder of her goals. She wanted to wear this bikini in the summer. Again, it didn’t happen immediately. 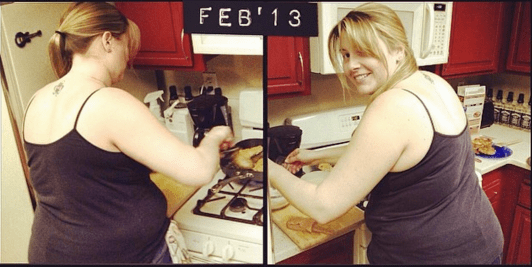 It took her close to a year but her after-photo proves that it can be done! Jaycie pointed out how important it is to never compare your journey with others. Decide to go on a journey of change for yourself but first determine why you want to do it. Again, the WHY is what will motivate to keep you moving forward. Share with us ‘What’s the WHY’ that will compel or has compelled you to make lifestyle changes to improve your health? WATCH THE FACEBOOK LIVE INTERVIEW WITH JAYCIE SULLIVAN! To view other past interviews, go to the Be Inspired page and click on Facebook Live Show. Are you ready to start your journey to better health? I have a free e-book for you to download full of tips that are small steps to include in your daily routine to improve on what I believe are the five main elements of Healthy Living – Nutrition, Movement, Sleep, Stress, and Community. Please visit link below to download book today! Congratulations to Jaycie.. what an accomplishment! And so true, our journeys are all different, so it is important not to compare. I love her determination and motivation. That’s great and congratulations to her!!! What an inspiring story! I love the idea of hanging your goal clothing as a constant reminder! This is such a great inspirational story and so true every story is different. This is very inspiring! Love reading stories like these and learning about others journeys. Really motivates you to keep going no matter how hard things get. Not matter what your journey is.